We understand how much we rely on our computers today and how difficult it can be without them. That’s why our aim at Bluefish Computer Services is to provide the most efficient service at the best possible price. 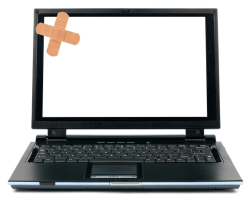 We specialise in computer repair and services, whether you need a laptop screen replacing, help setting up a new PC, upgrades or any other computer related service we can help. Bluefish is very proud to be a WSCC Trading Standards Approved company, something we worked very hard to achieve. So whether you just need some friendly advice over the phone or some further help Contact Us today.